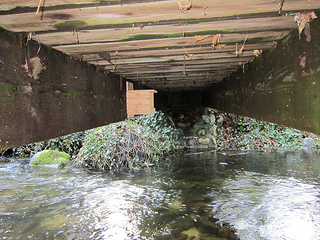 Last year, 2012, on Ashland Creek a pair of dippers used a nest box built by Eric Setterberg. 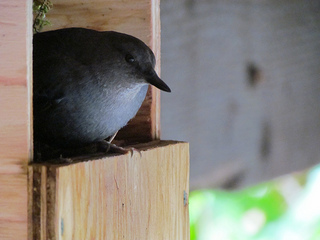 It was a simple box that the dippers used to build their moss dome nest. 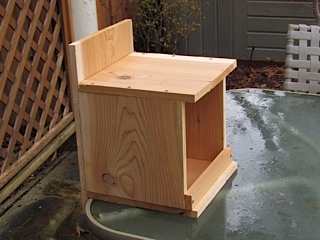 The pair that used the box had 2 broods. 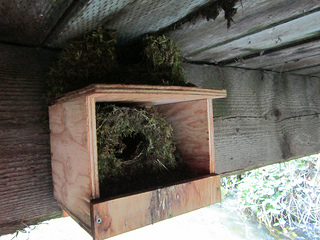 The first nest was built inside the nest box and the second was built on top of the box. The female began building the nest during feeding of the first nestlings and started laying eggs a couple of days before the first brood fledged. The male primarily fed the young birds. American Dippers start their courtship, pair bonding and stake their territorial claim in mid-winter, February. 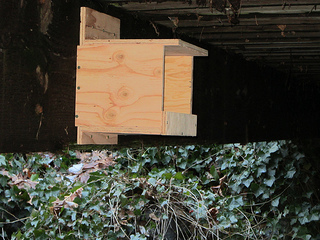 We attached the nest box to the wooden crossmember on one of the footbridges in Lithia Park, but these boxes can be attached to any number of bridges or even mounted to a post in a stream that hosts dippers. We offer this as a simple but elegant solution to stream areas where nesting sites for dippers have been compromised by human development. Feel free to steal it and make your own! 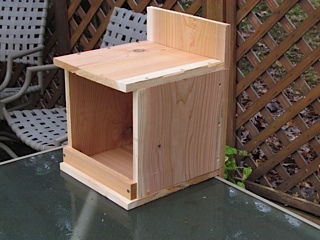 Materials: 1” x 12” x 6’ Cedar fence board (actual finished cut is ¾” x 11 ¼” x 6’, makes one box). Look for boards with minimal knots, no splits and flat. Assembly requires 21 -1 ½” deck screws, mounting requires 5 – 3” deck screws (or similar). Tools recommended: table saw, or circular saw, square, tape measure, drill-driver with Philips bit, and 1/8” drill bit for pre-drilling the holes for the screws (cedar can split easily if the holes are not pre-drilled). Other wood such as plywood or pine could be used, but cedar works well as it does not need treatment to preserve the wood. Assembly: Cut out all pieces. Mark the back piece edges starting at 3” from the top down 11 ½”. Pre-drill 3 holes on each of side of back piece, evenly spaced about 3/8” in from the edge. 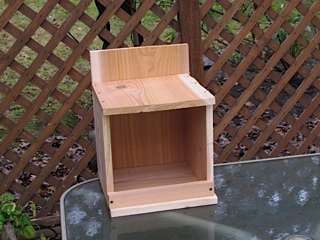 Assemble the top to one side (a vise works well to hold the side piece). Then assemble the back to the other side making sure the top of sides are level. Assemble top piece, then bottom piece and front lip, always pre-drilling the screw holes. Each piece is attached with 3 screws. Also pre-drill the holes for the mounting screws, 3 on top, 2 on the bottom. 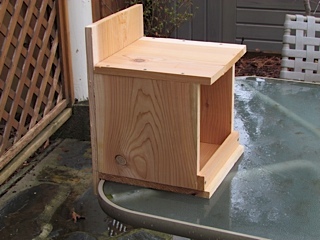 The finished box should result in about a 10” x 10” x 10” space for the nest to be built.